Is there such a thing as posting too many photos to Instagram when traveling? I say yes. Sometimes when I travel I have to sit on my hands so I won't post too many photos to Instagram of the sights I am experiencing at the moment. I think it's fun to share things we like, or see. However, I do believe that a person can certainly overshare their experiences on social media, especially bloggers who may be on a trip as a guest of a tourism board or public relations firm. There have even been studies on oversharing, and why we feel the need to share things on social media. A Harvard study revealed that sharing our thoughts actually activated the brain's reward system, and made us feel good. Here is the flipside though. 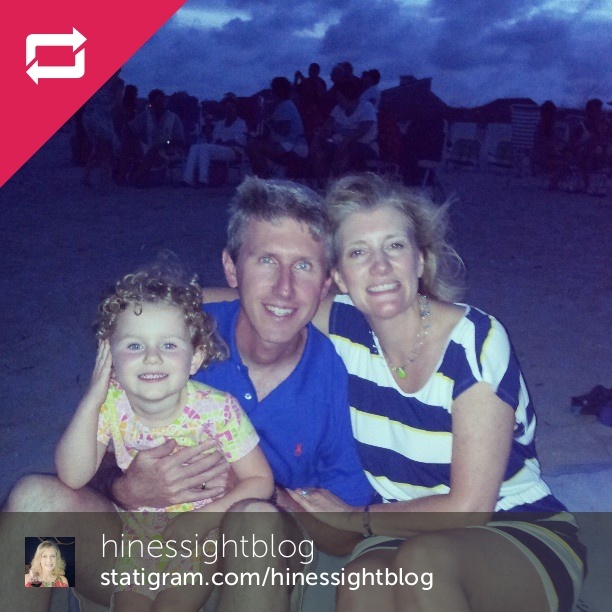 How does it make that person who is at home seeing your Instagram feed feel? I usually view my Instagram feed in the kitchen before I load the dishes at night. 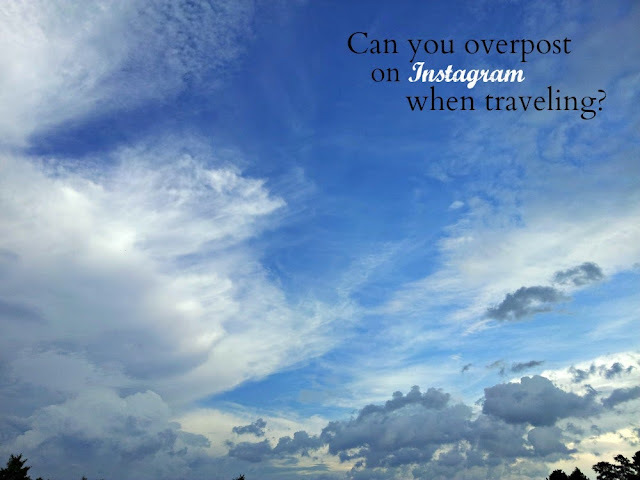 I get annoyed if I see a photo from the same person every five minutes when they are traveling. Am I jealous? I don't think so. I get annoyed because it clogs up my feed. and then five minutes later, posted this photo. I may have liked or commented on the first photo in my feed, but the second photo I'm going to scroll right by it. No comment. No like. Honestly, It's just too soon for me to see another photo from the same person in my feed, especially a photo that looks almost like the first one. Show me another photo an hour or two later, and I'm more likely to react and engage. Katja Presnal is an Instagram expert, and she believes that an effective Instagram user tells a visual story on Instagram without saying much at all. It's best to take a lot of photos then post your best one. When looking through my photos, I decided this photo would be more interesting on Instagram, and shared this one instead. It told the story of colonial life in a colorful way. It was average on popularity with only 19 likes and 3 comments, but if I had posted those same three photos in a row within 30 minutes, I imagine that the engagement and likes in my feed would have been even less. I may would have received an unfollow, too. When Katja Presnal travels, she only posts six photos a day to her Instagram account. That is max for her. I post a little more than that because my brain must love it and it thrills me, but I've certainly learned to hold back photos from when I first started using the app. For one day of sightseeing in Williamsburg, Virginia, I posted eight photos that were spread out over a 12 hour period. I post to tell a story, and I try not to overshare. And truthfully, those people in your feed, the non-bloggers, probably post even less than Katja. My sister-in-law and her family spent a week in France in June. I actually found myself stalking her feed daily to see if she posted anything on her trip. I was so curious. Some days, I didn't even get one photo at all from her. On a good day, I got maybe three. I found myself wanting to see the inside of her house rental, and perhaps the restaurant they dined in while in Sarlat. As a follower of her feed, I wanted more, and found myself going to her home Instagram page to make sure I didn't miss anything. Is that an example of less being more effective, if you are a brand or blogger? I think so. What do you think? 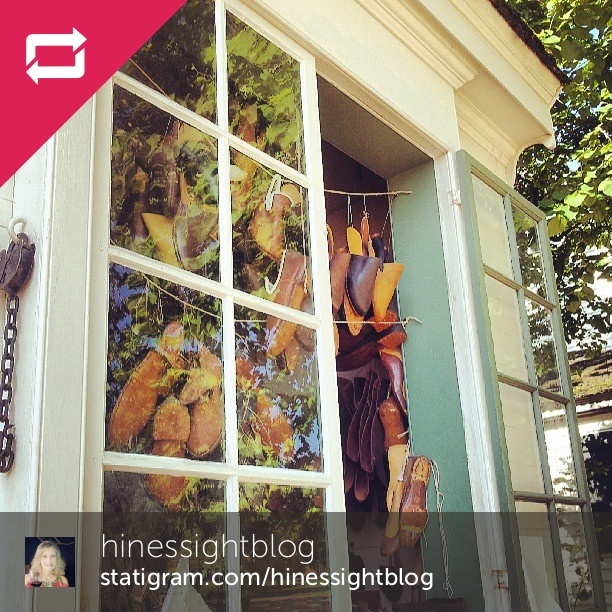 Let's talk more about Instagram on Twitter. Today is an exciting day for Instagram Travel Thursday because the weekly hosts are hosting a Twitter chat at 12:00 p.m. EST today to discuss our views on how Instagram can be an effective tool for travel planning. My Skimbaco editor, Katja Presnal, who has authored the book, Instagram as your Guide to the World - How, What and Who to Search and Follow on Instagram to Help You Travel the World, will be on hand to lead the discussion. We will be offering Katja's book as well as a Marimekko iphone case as some of the prizes during the chat. Join us, if you are available. If you are a blogger, link up with us. Take a look at the link-up rules below before linking, and please link back to a host so others can find everyone's links. 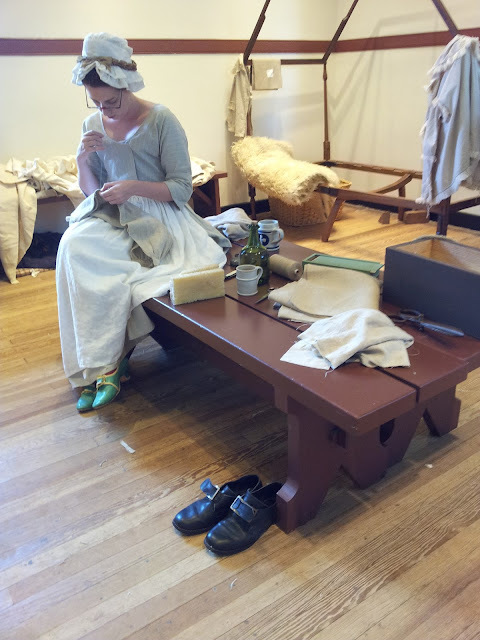 For more information on travel to Greater Williamsburg, and to see colonial life in person like my family did, visit www.visitwilliamsburg.com. Instagram has given me so many ideas for future travel. When it comes to scenic photos, it's almost like the next best thing to being there. However, no phone app will ever be able to replace the joy of experiencing travel in person, especially when it comes museum exhibits. 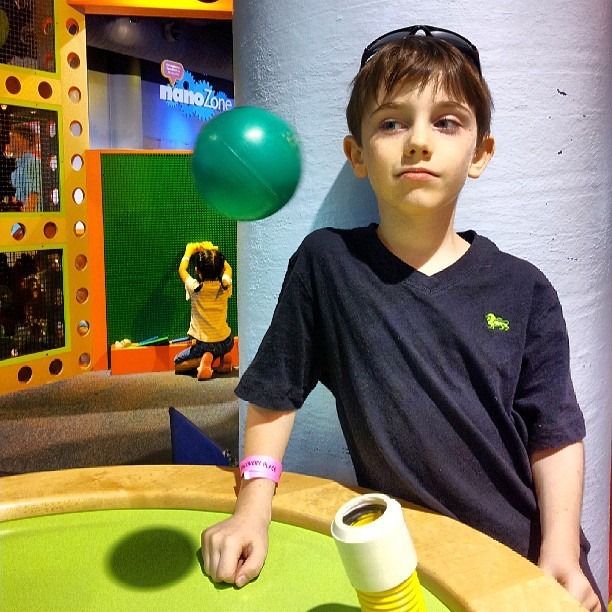 Last month, my friend and I took our kids to Discovery Place in Charlotte, N.C. You may have seen some of these photos on Instagram. We were surprised to meet a tooting cow in person. Words just can't describe this amazing Animal Grossology exhibit at the museum. I think we were all in awe. 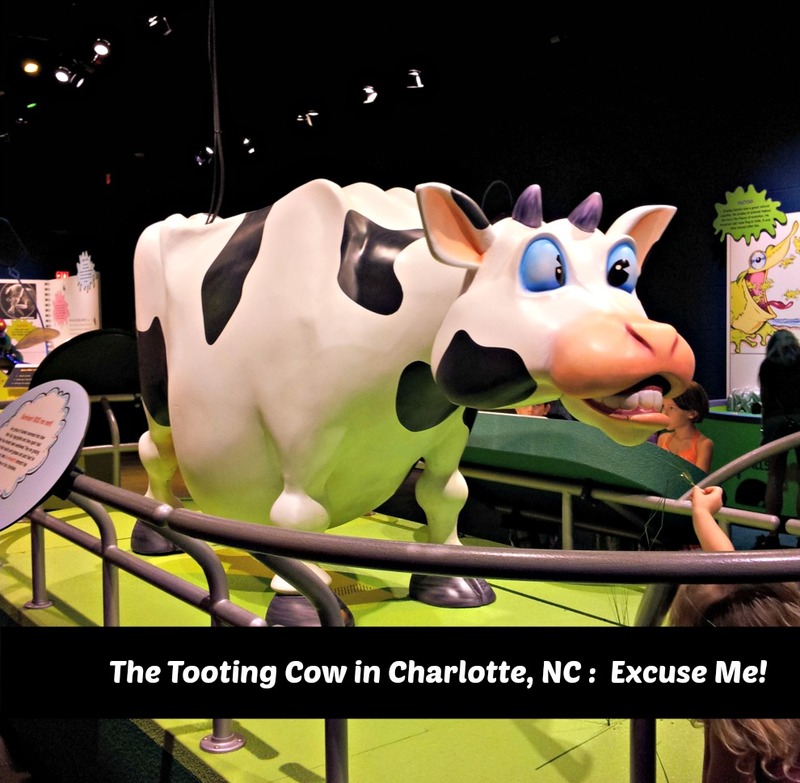 What is not to love about a tooting cow? Seriously, it eats grass then you watch the grass go through the cow's stomach, and the finale is a big, ole toot. I am sorry, but I howled. This is a great example of museums making learning fun for both kids and adults. And the kids loved it because the entire exhibit let them laugh and giggle about what they love to laugh and giggle about: bathroom humor. 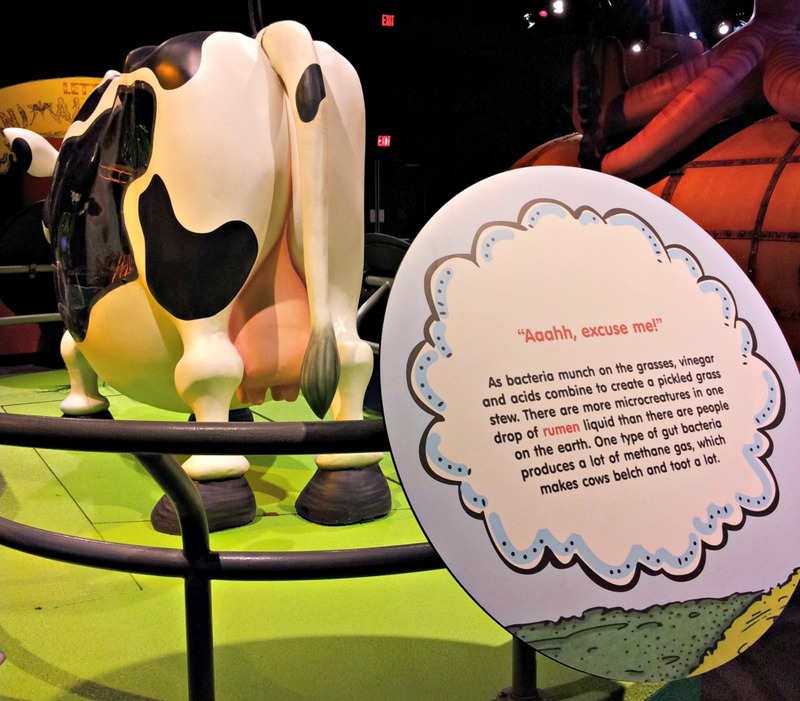 Animal Grossology is a special exhibit which will be at the Discovery Place museum in Charlotte until January 1, 2014. It is based on the popular "GROSSOLOGY" series of books by Sylvia Branzei. It has been such a popular exhibit that the museum has extended its stay. The exhibit is just a small part of the museum though. There is so much more to see and do. Discovery Place provided hours of entertainment for us. There is something for every age to discover about science. Our children left with a new appreciation for science, and I did, too. Through interactive exhibits, we learned that science is fun, and full of discovery. The museum is open daily in Uptown Charlotte. The cost is affordable for families, compared to theme parks, and they have price points that also include IMAX admission. I highly recommend a visit if you find yourself visiting North Carolina this year. 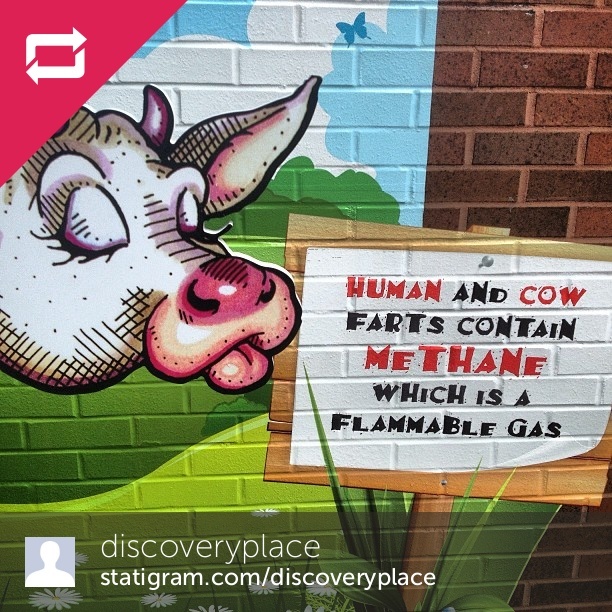 And Discovery Place is also on Instagram. Charlotte is about a three-hour drive from Raleigh, N.C. I guess we could have easily done the trip in one day if we had wanted, but we really wanted to make a fun,overnight excursion out of it. My Facebook and Instagram community told me that they like to spread out a bit when traveling with children. 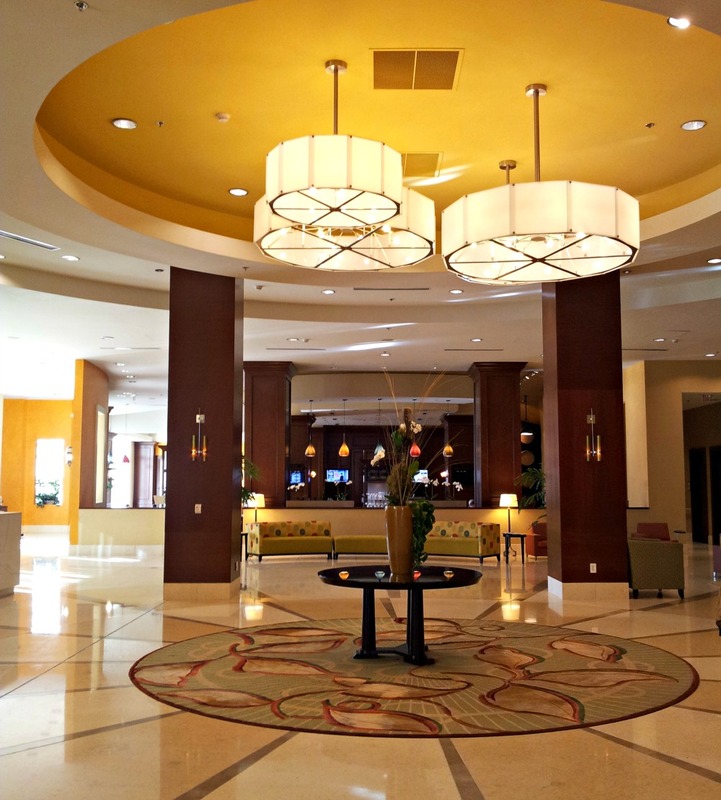 I don't like to recommend properties to readers unless I've checked them out myself, and this trip gave me the opportunity to review an upscale, affordable-luxury priced hotel for families. We stayed in a two-bedroom suite at Staybridge Suites Ballantyne. We had two double-beds in one room, a queen bed in another bedroom, two full-bathrooms, a full-kitchen, and a sleeper sofa. I was so impressed with the Staybridge Suites in Charlotte Ballantyne. It made a great base for our overnight trip. We were two moms traveling with four kids. We felt safe, secure, and highly welcomed, even though the hotel caters to many professionals on business during the week. We were the only ones with younger children on this night, but that was OK. We still went to the complimentary social anyway, and ate lots of delicious cookies which were a big hit in my Instagram feed. The bedding was good. The amenities were upscale. 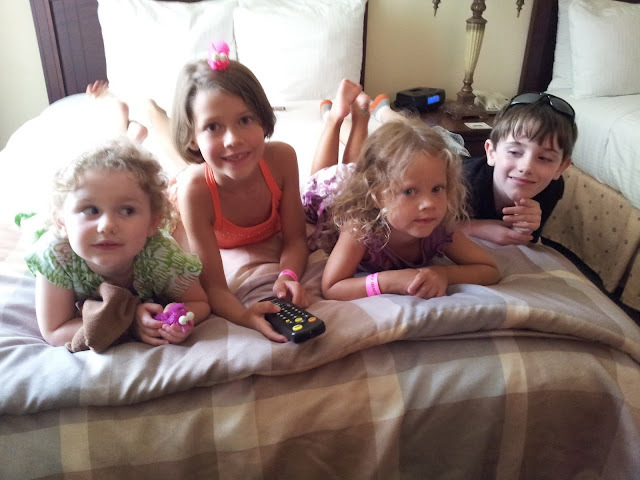 The hotel offered free wi-fi, and the in-room popcorn was a great touch for kids. Honestly, the value is unbeatable for the stay. The hotel also provides complimentary breakfast each morning plus books and games for kids. I know the Ballantyne Hotel Group runs a tight ship, and their hotel properties in Charlotte are excellent, but I also believe they are upholding the standards of the entire IHG group brand. For this reason, I do feel comfortable recommending the Staybridge Suites for travel anywhere. I also give two thumbs up to the complimentary beer and wine socials, which are also at every Staybridge Suites property across the country. These two wine glasses were an Instagram favorite. I am still a luxury hotel girl at heart, and would probably seek out IHG's luxury brand, Intercontinental, for my own vacations when possible, but I would definitely stay in a Staybridge Suites, too and be perfectly content. 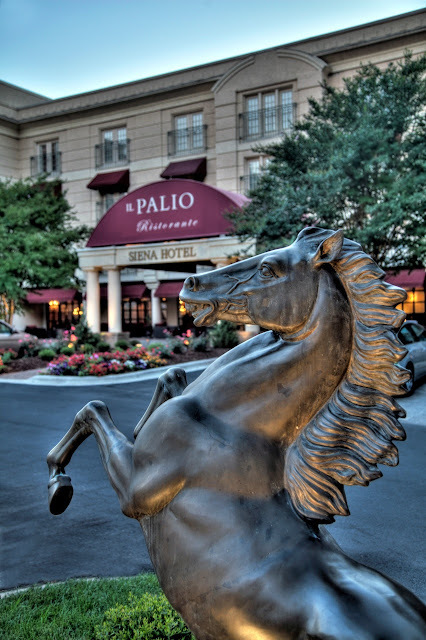 I will always have a special fondness for this Charlotte Staybridge Suites hotel's sister hotel, The Ballantyne Hotel and Spa (my very first "Pack Your Bags" of 2012), but a two-bedroom suite in a luxury hotel for an extended stay breaks most budgets, and this makes a good alternative. Based on my own stay, I believe Staybridge Suites provides an excellent upscale experience for those families seeking more space when they travel. 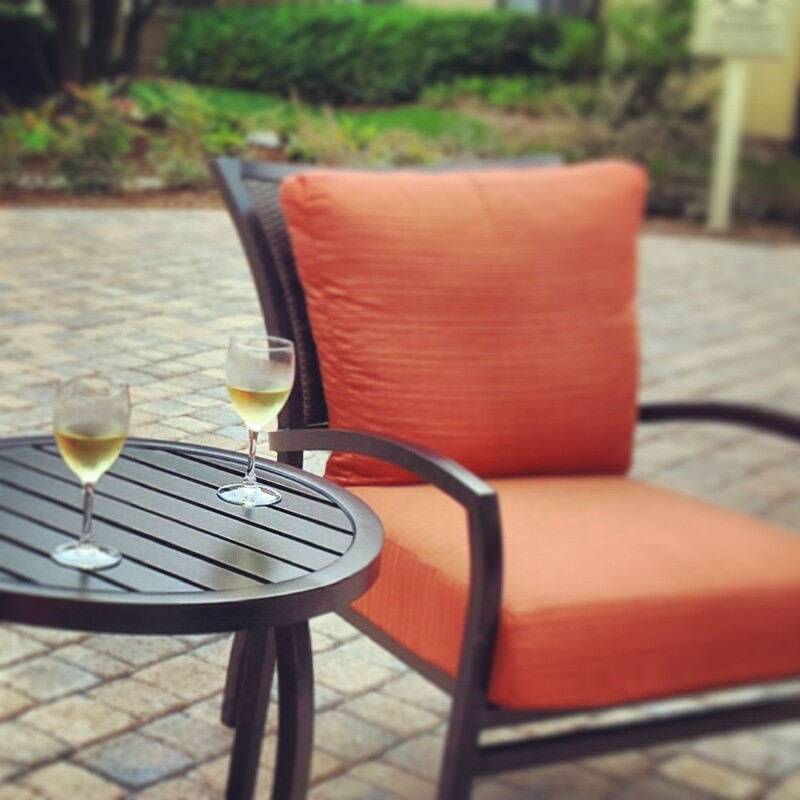 Rates for a two-bedroom suite is usually priced around $225 per night, depending on season and availability. Before we mention the link-up, let's talk about Instagram travel on Twitter. Join me for a special Instagram Travel Thursday Twitter Party next week on August 29 at 12:00 pm (EST). If you are a blogger, please join us in the Instagram Travel Thursday link-up. Take a look at the link-up rules below before linking, and please link back to a host so others can find everyone's links. Disclosure: I was a complimentary media guest at Staybridge Suites in order to write about the Charlotte area as a travel destination. 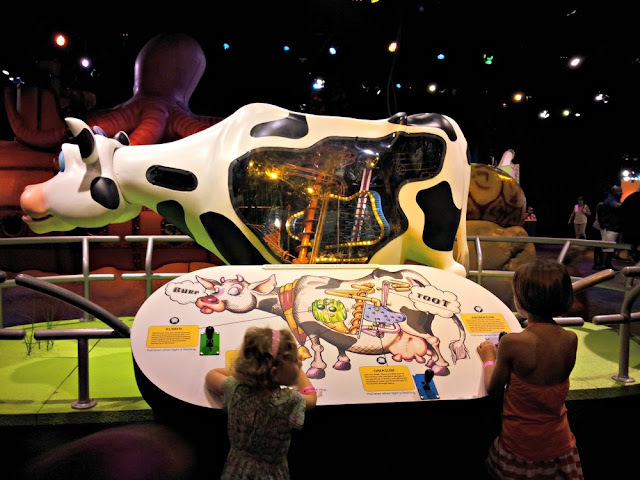 We paid for our own admission to Discovery Place., and smelled the toots just like everybody else. 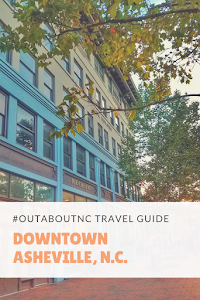 As always, opinions about my travel experiences are my own, and I appreciate Charlottesgotalot assistance for story ideas in the area. 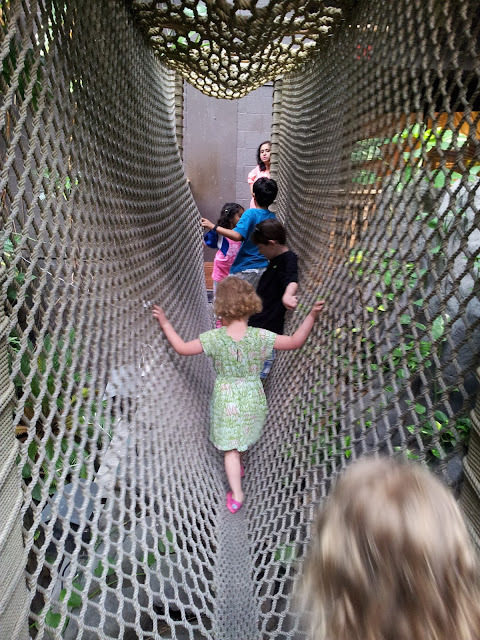 #TravelTuesday Photo: Here's Where You Can Put the Kids in Williamsburg! I've got so much to tell you about Williamsburg. Once I get these two rascals back in school, I will be back on a better writing schedule. 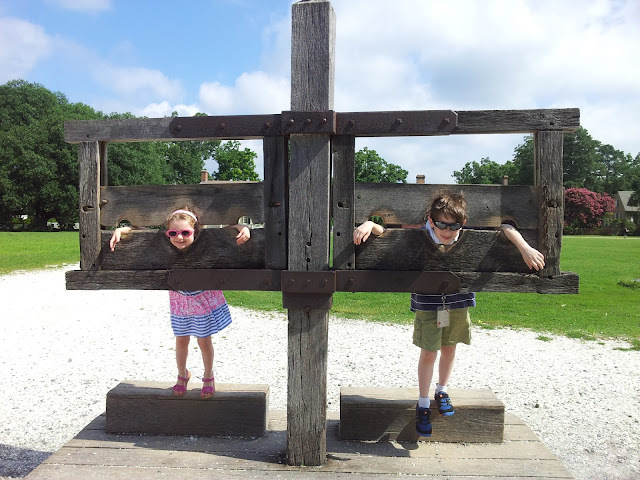 I did want to mention to you that if you are on the fence about taking your kids to see the Revolutionary City in Colonial Williamsburg then do it, especially elementary-aged children. My son loved it. And I really wish we had more time there. We certainly didn't see it all. I won't sugar-coat it here. Preschoolers are going to love seeing the big red furry guy down the street in Busch Gardens and swimming in the resort pool a little more, but they will still enjoy the experience. 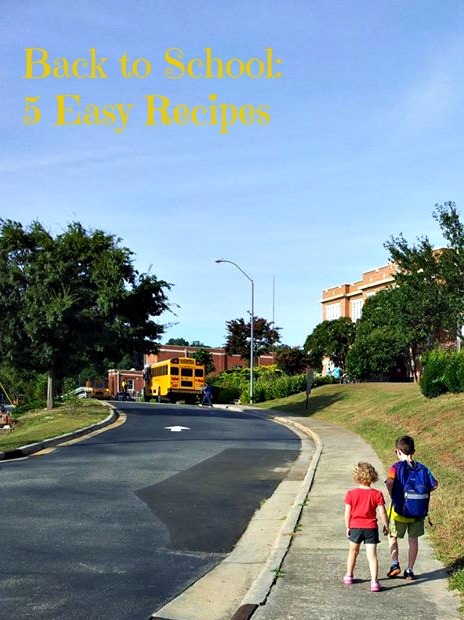 Take a stroller for the preschoolers. You will need it. They aren't allowed in the historic buildings, but this little one got tired, and complained a lot. However, we were also having a heat wave. It felt like 100 degrees with the humidity. 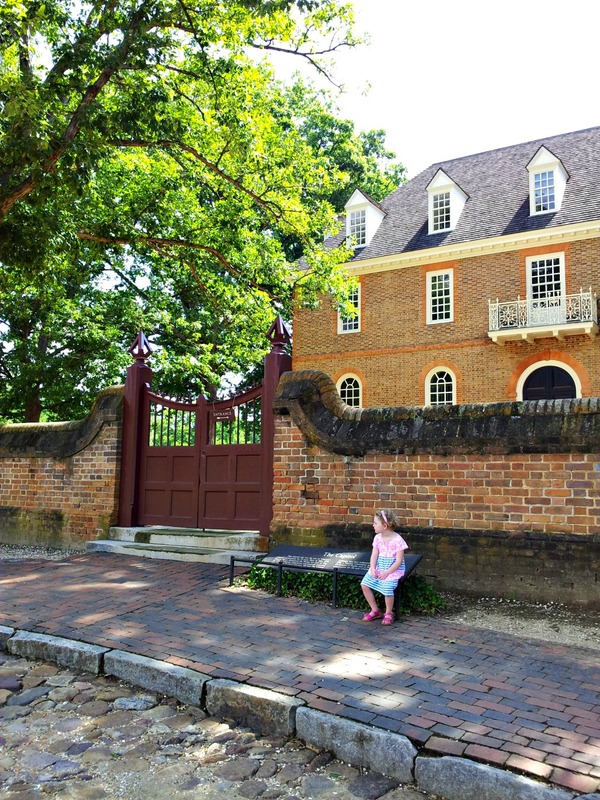 Summer is almost over, but Colonial Williamsburg still has some of the best vacation deals out there before school starts, where kids can stay, play, and eat free. 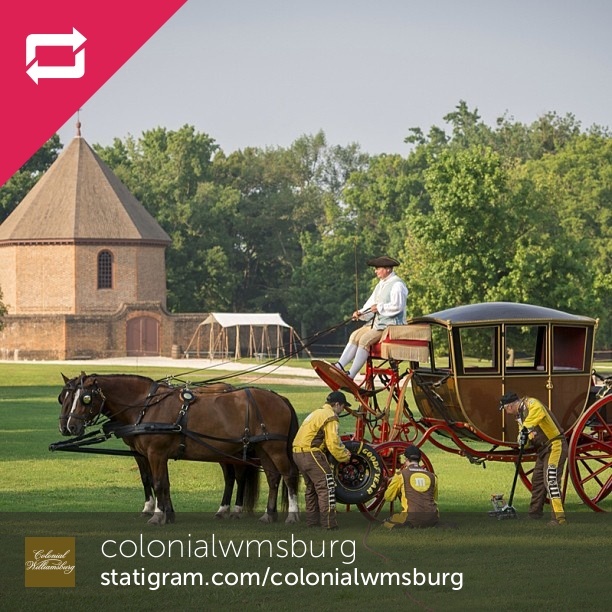 For more information on travel to Greater Williamsburg, visit www.visitwilliamsburg.com. Occasionally, I walk into a grocery without a list. Yeah, I live life on the edge. If I pick up a store flyer, I may be inspired to make a recipe which has ingredients on sale. That is how I found my Maple-Mustard Pork Chops with Caramelized Apples recipe. 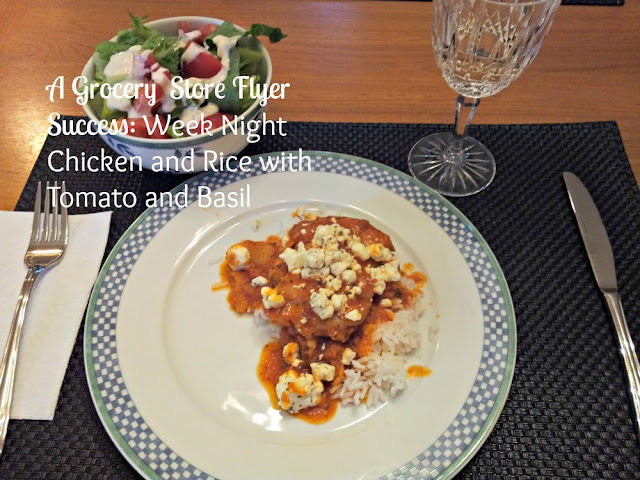 I have found a new weeknight recipe the exact same way. 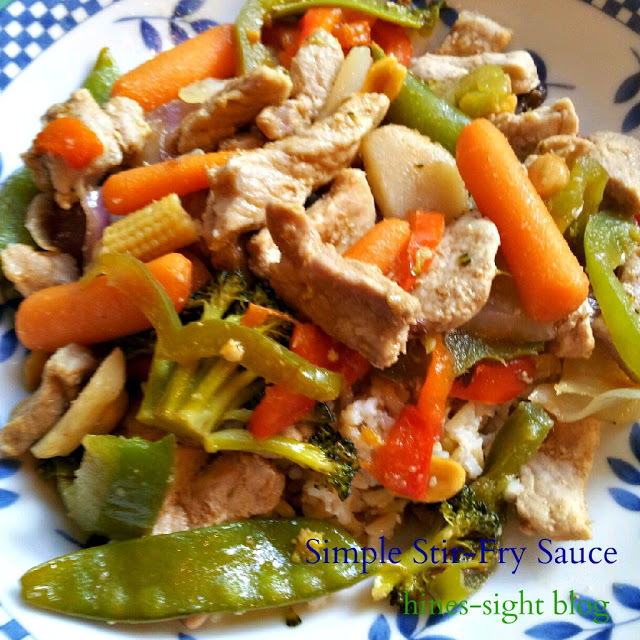 The recipe was from a May 2013 Fresh Market flyer. Will loved it, and said it was a keeper. 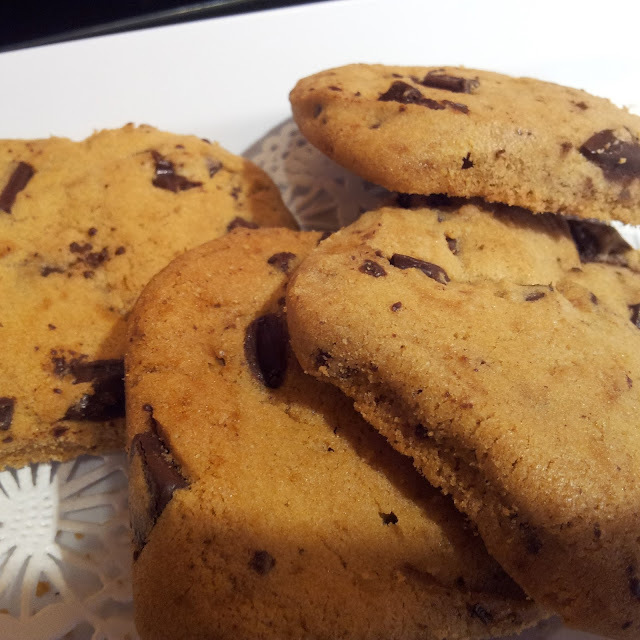 Unfortunately, I am not a food stylist, and the dish I served and photographed is rather homely. But, that is what we ate. 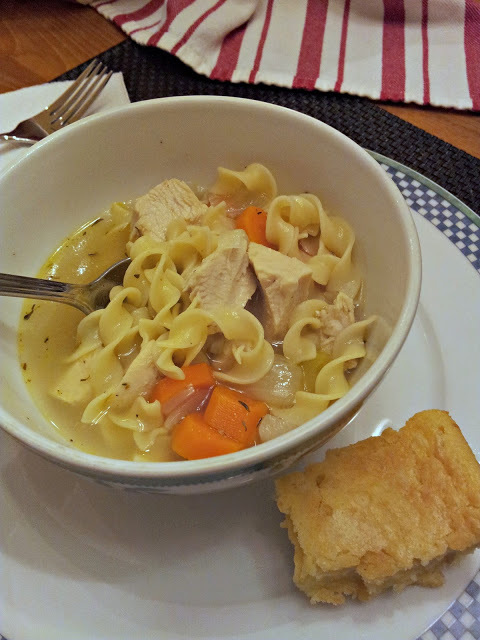 Several of my Facebook friends wanted the recipe after I raved about it online. I kept telling them that I would put it on the blog. I just didn't know it would be almost 12-weeks later. Even though it's not Pinterest pretty, it's big on taste, and is great for a quick weeknight meal. Heat olive in deep skillet over medium-high heat for 2 minutes. Season chicken thighs to taste with salt and pepper and sear for 2 -3 minutes on each side. Remove chicken to plate and set aside. Reduce heat to medium, add onion and garlic and saute 3-5 minutes or until tender. Remove pan from heat and add wine, scraping up any browned bits from the bottom of the pan. Allow wine to simmer and reduce by half, about 3 minutes. 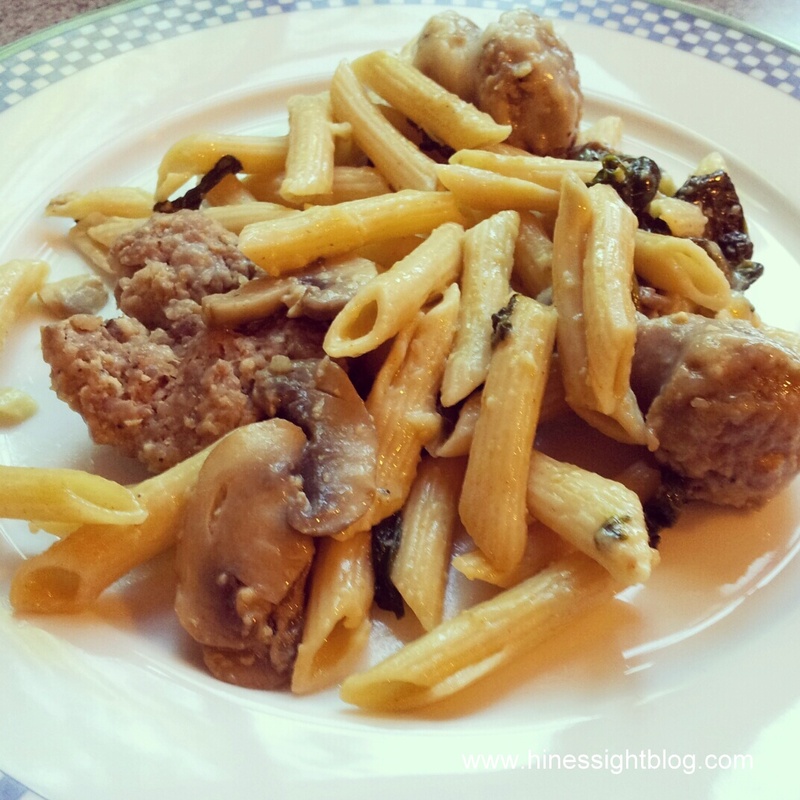 Stir in 1 jar of pasta sauce and return chicken to pan. Allow to simmer for 5 minutes or until chicken is cooked through. Serve over rice. 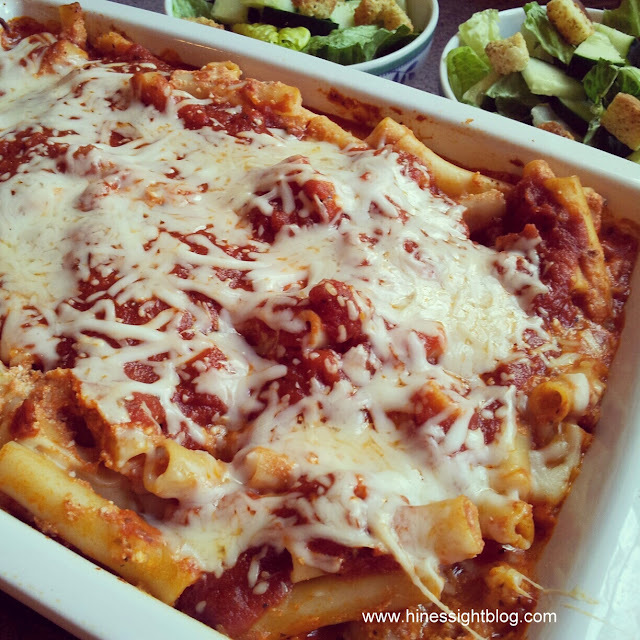 Top with feta cheese crumbles. *This recipe was adpated from a Fresh Market flyer, and the grocer recommended specific brands. I used whatever brands I wanted to use, aside from the wine. I did use organic chicken thighs from Fresh Market. The Primal Roots White Blend has a honeysuckle, peach, and apricot sweet taste. I had it with dinner, and would buy it again. $8.99 a bottle at Fresh Market. PS. It's also fun to drink the wine while you are cooking. My family spent a few days in Colonial Williamsburg last month on vacation. 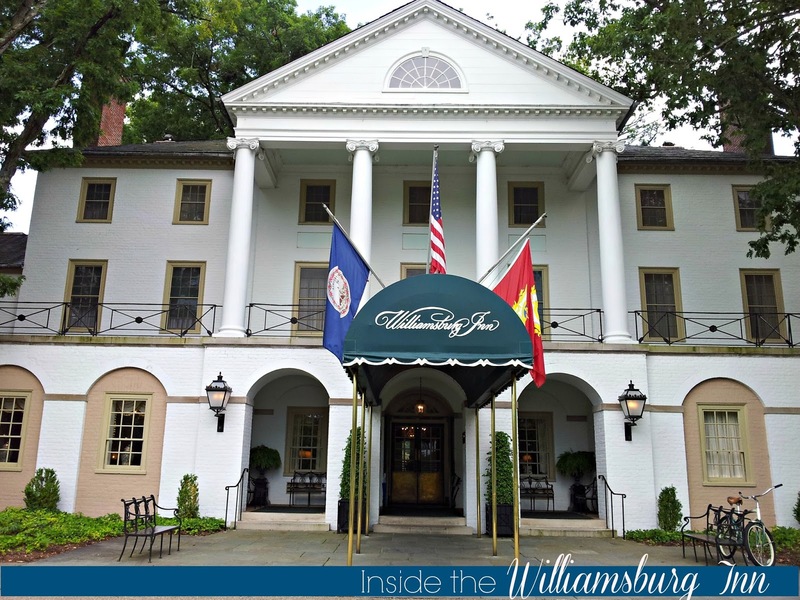 As an afternoon tea lover, I really wanted to have the Afternoon Royal Tea at the historic and luxurious Williamsburg Inn, which is located in the heart of the historic district. 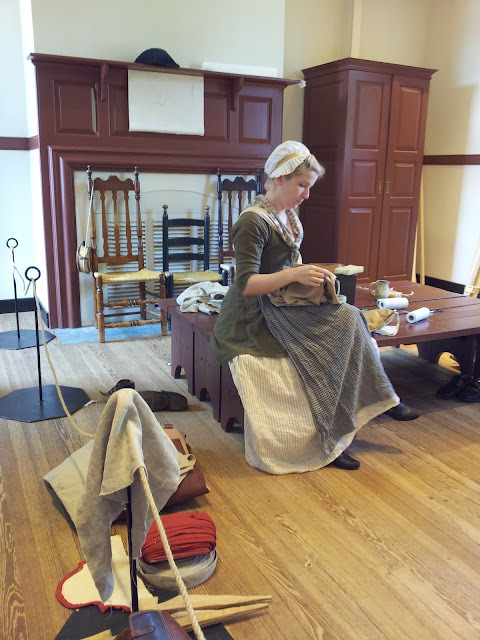 Unfortunately, my visit to Williamsburg did not coincide when tea was being served at the Inn, which is served seasonally, Thursday through Saturday from 3:00 p.m. to 4:30 p.m. in the Goodwin Room. But, luck was definitely on my side, and I got a royal treat anyway. The Colonial Williamsburg Foundation gave my family a private tour of the Inn since they know that I'm such a luxury hotel lover. 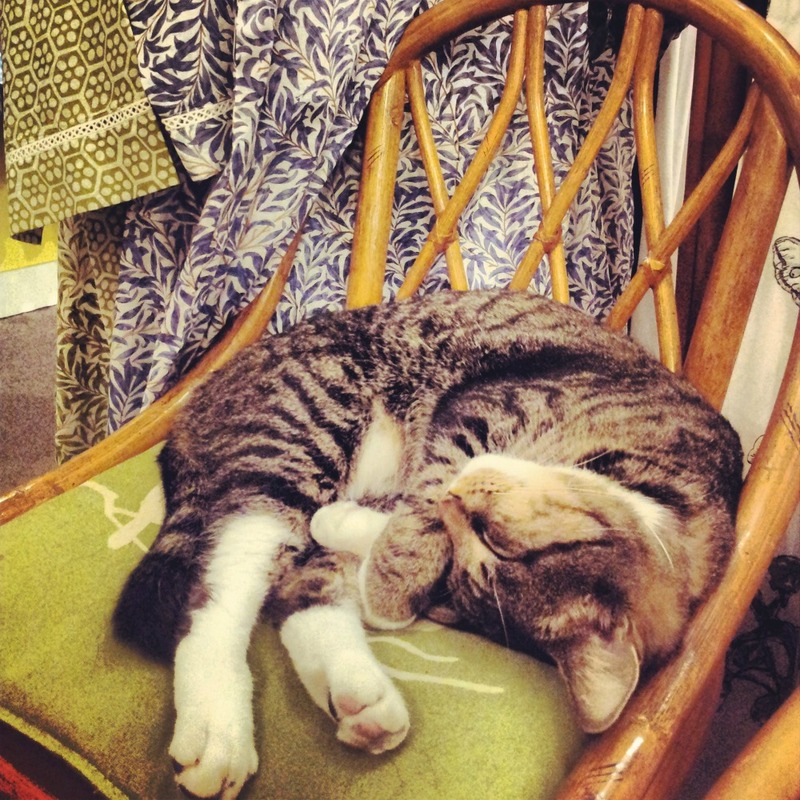 Many of these photos were also in my Instagram feed while we were in Williamsburg. 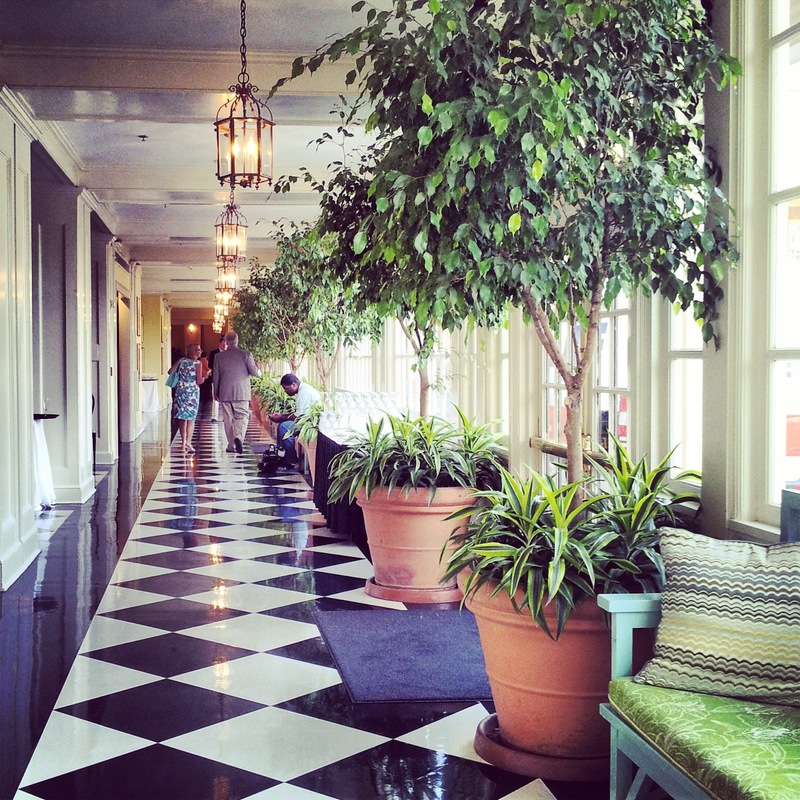 The Williamsburg Inn Lobby. 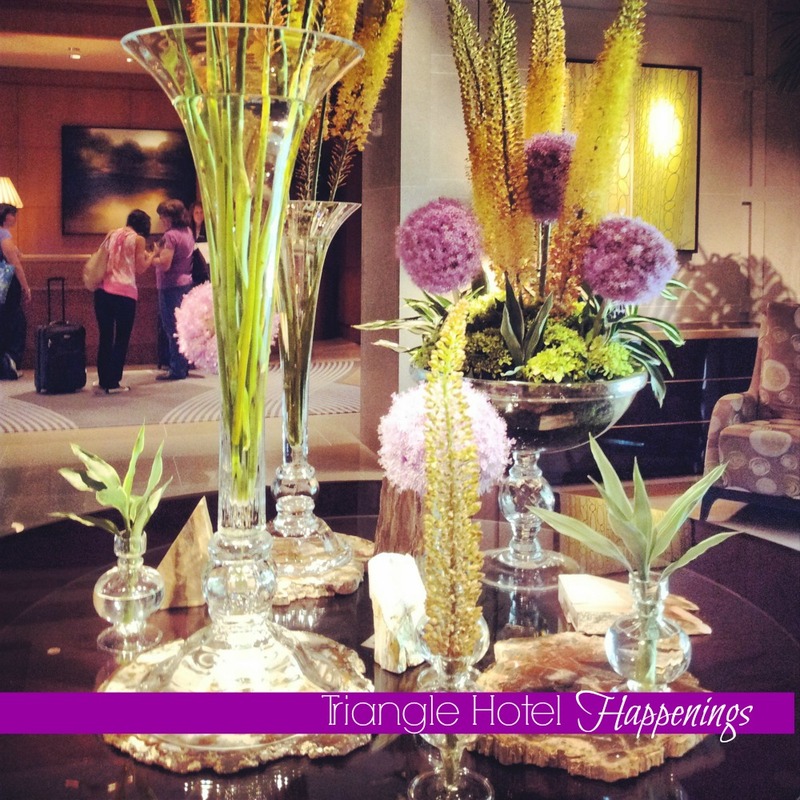 Floral design in the hotel is by floral designer, Clark Taggart. His team works to add elegance to every hallway and public space, reflecting the colors of the Inn and themes of the seasons. The Williamsburg Inn is Colonial Williamburg's landmark property, and opened to guests in 1937. John D. Rockefeller Jr., oversaw every detail, and made sure that the Inn provided "comfort, convenience, and charm." For luxury hotel history buffs, it was the first hotel in the United States to provide air-conditioning. Rockefeller wanted the absolute best for this Inn, and it has continued to maintain his standard, 75 years later. This stunning room was site of an International Summit led by President Ronald Reagan in 1983. 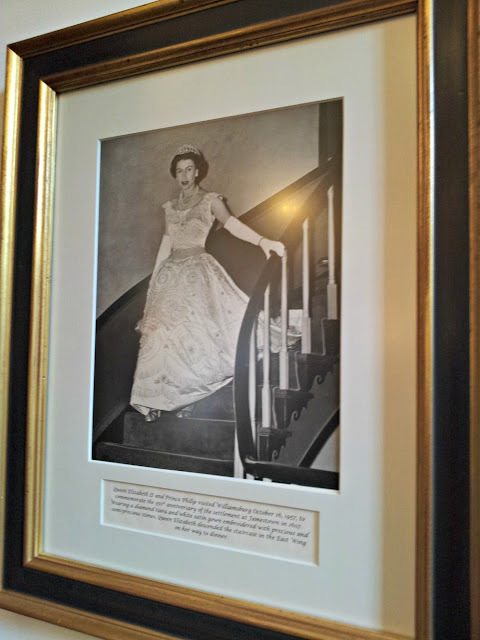 Rockefeller and his wife, Abby Aldrich, felt strongly that the Inn should be as unlike a traditional hotel as possible, preferring the the furnishings and decor to have the ambiance of a gracious country residence. The Inn's Regency style of early 19th-century England was purposely chosen to contrast the colonial architecture of the neighboring Historic area. The Regency style of the Inn is evident in neoclassical architectural features ranging from interior cornices and chair rails to the exterior's pediments, arches and columns. 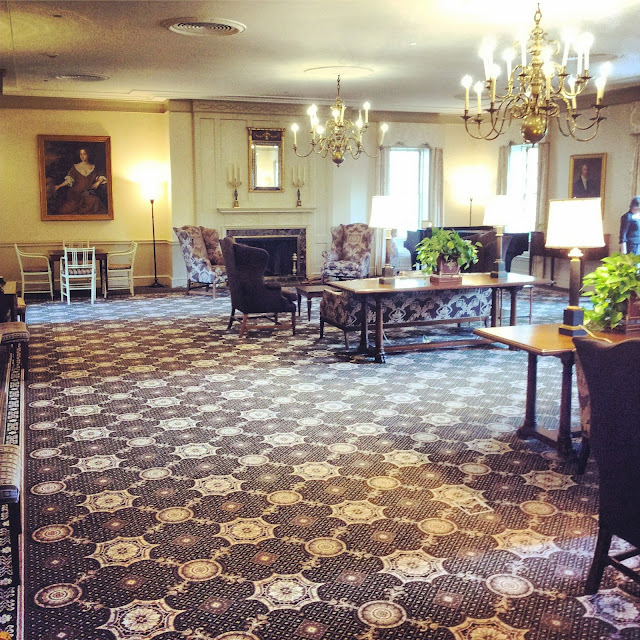 The public areas of the Inn certainly remind you of a very rich aunt's home, who possibly could even be the Queen of England. 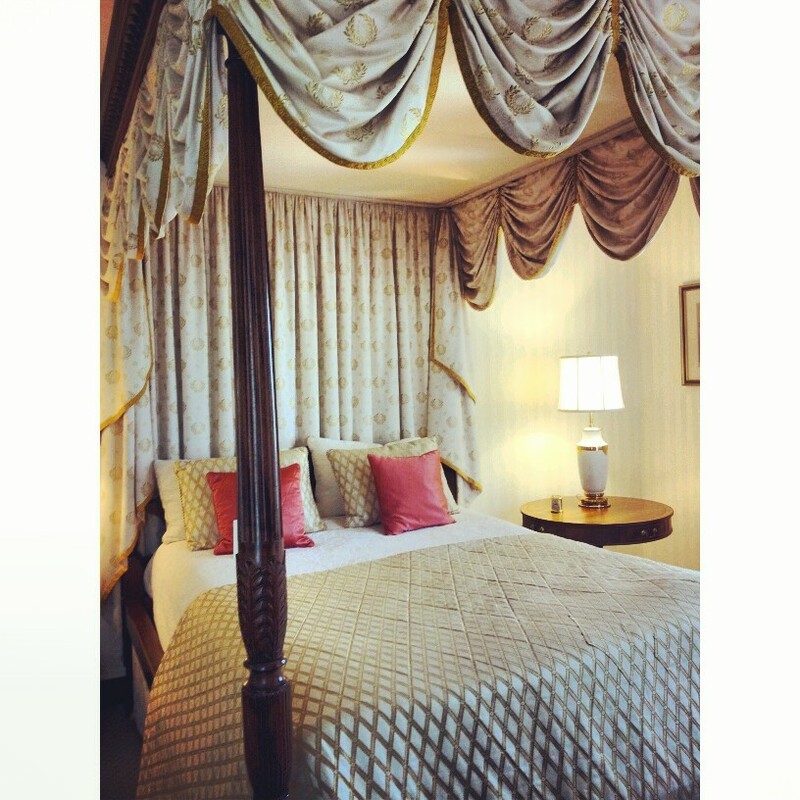 This Inn is certainly suited for a Queen, and has hosted Queen Elizabeth II twice, once in 1957 and again, in 2007. This is the suite where she stayed during her visit in 1957. 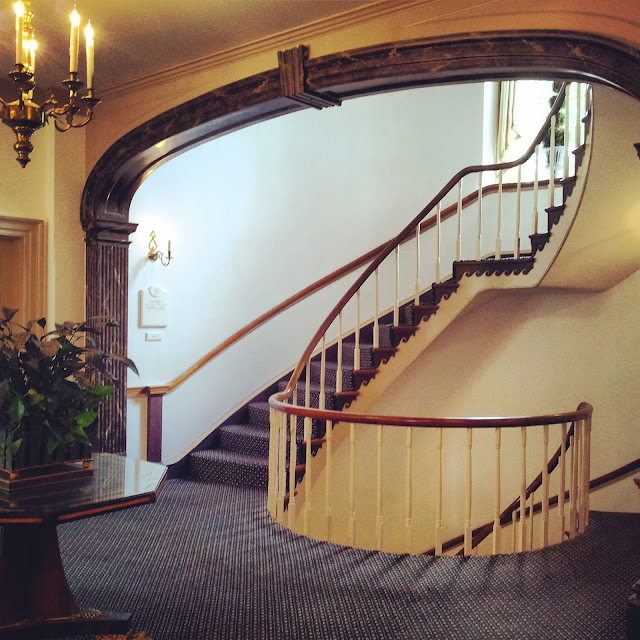 Staff at the Inn now call the staircase in the East Wing, the Queen's staircase. Her suite was at the top of the stairs, and she came down the staircase to a formal dinner, in honor of the 350th anniversary of the settlement of Jamestown. 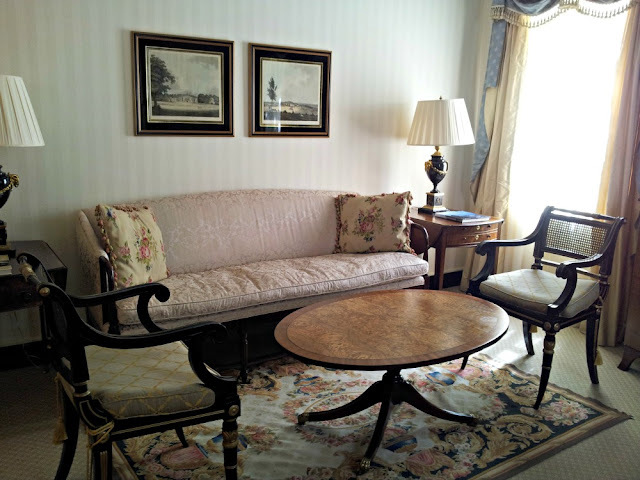 The Williamsburg Inn is intimate with just 62 guestrooms and suites. The Inn's guest rooms are decorated in three distinctive styles: floral, classic, and restoration. All rooms feature period furnishings, original artwork, and handmade silk window treatments that have been a Williamsburg Inn signature for decades. The Williamsburg Inn, a member of the Leading Hotel of the World membership, is the only luxury-premium hotel owned by Colonial Williamsburg that has an evening turndown service with night spreads, slippers, robes, and an evening turndown tray. You will learn more about Colonial Williamsburg's other premium property, The Williamsburg Lodge, in my next "Pack-Your Bags" feature. 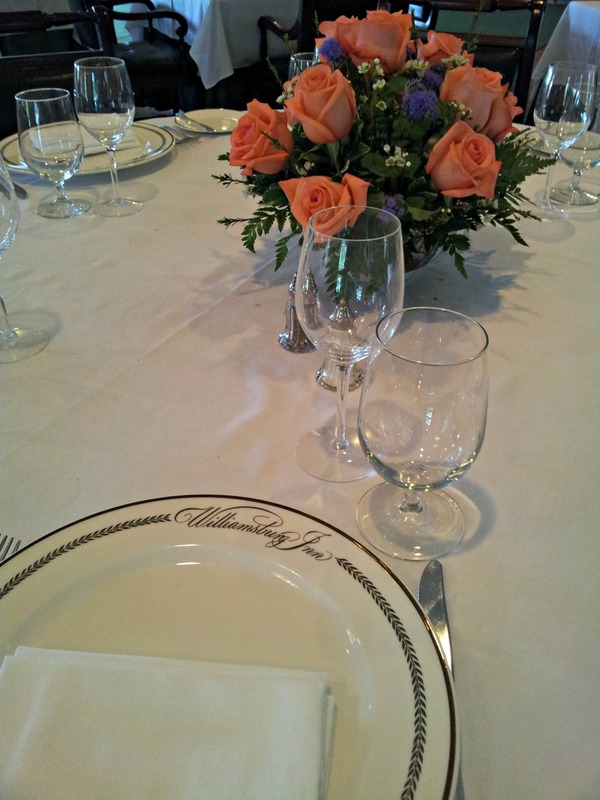 The Williamsburg Inn is also home to the elegant and formal restaurant, the Regency Room. This upscale restaurant celebrates classic American cuisine with traditional European roots. 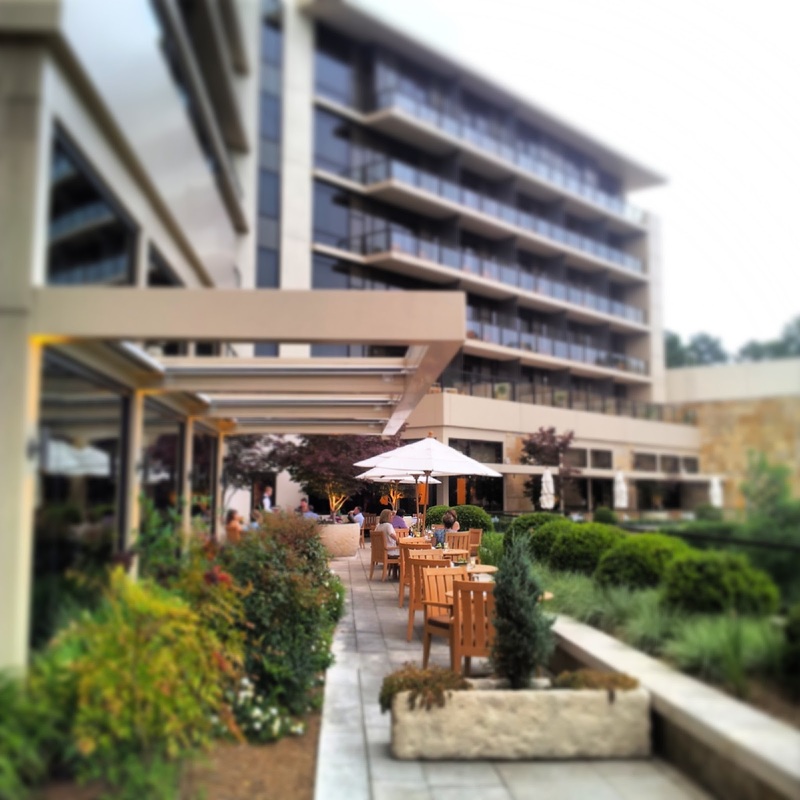 Just in time for Fall, Sunday brunch will resume at the Inn on September 8. 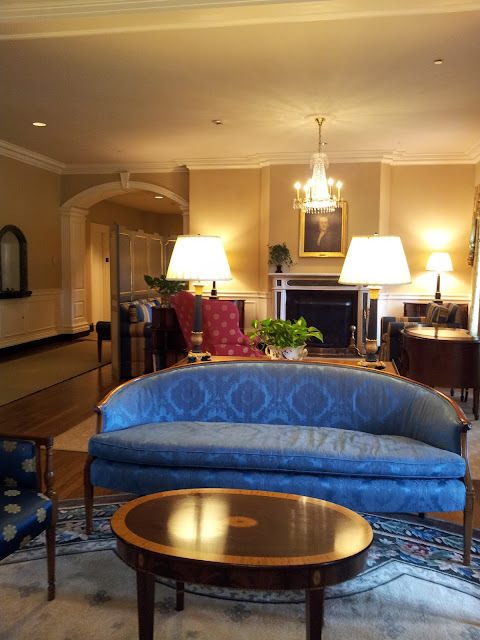 If you want to "Pack Your Bags" and stay in the Inn, rates for the Williamsburg Inn begin around $450 a night and up. 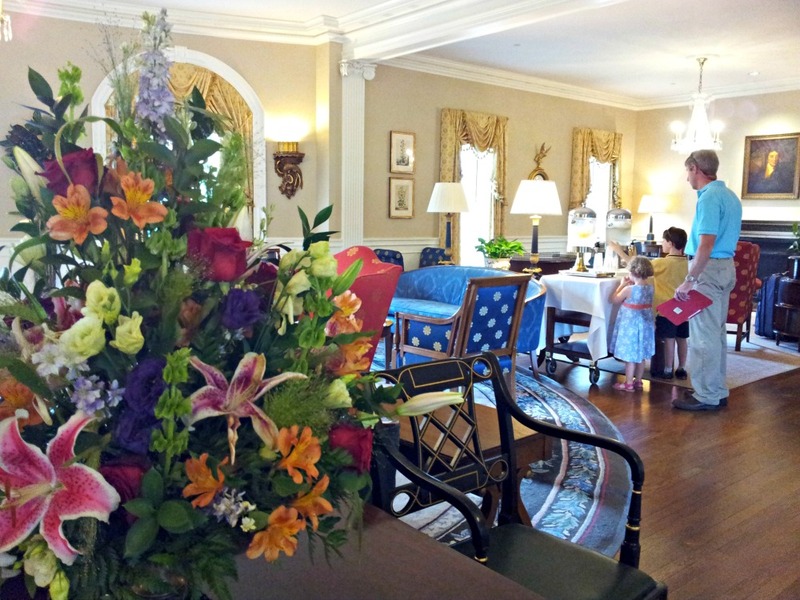 Colonial Williamsburg has packages that include tickets, meals, golf, and spa treatments. The Inn is operated by the Foundation's subsidiary, the Colonial Williamsburg Company. 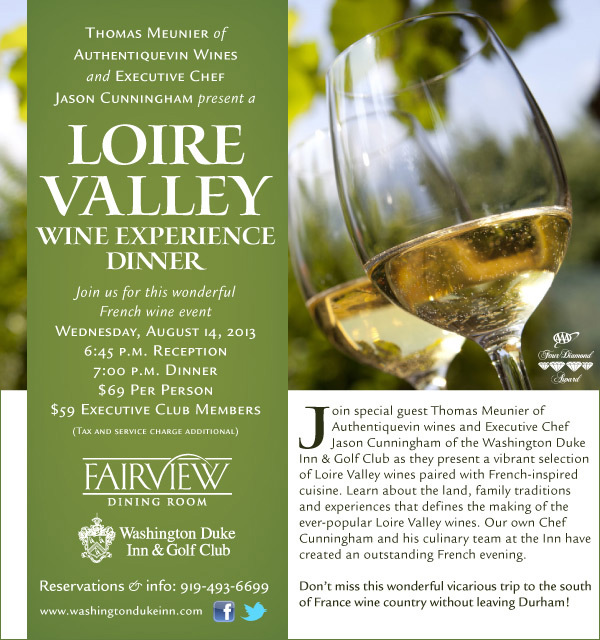 All revenues support the Foundation's preservation, research and educational programs. 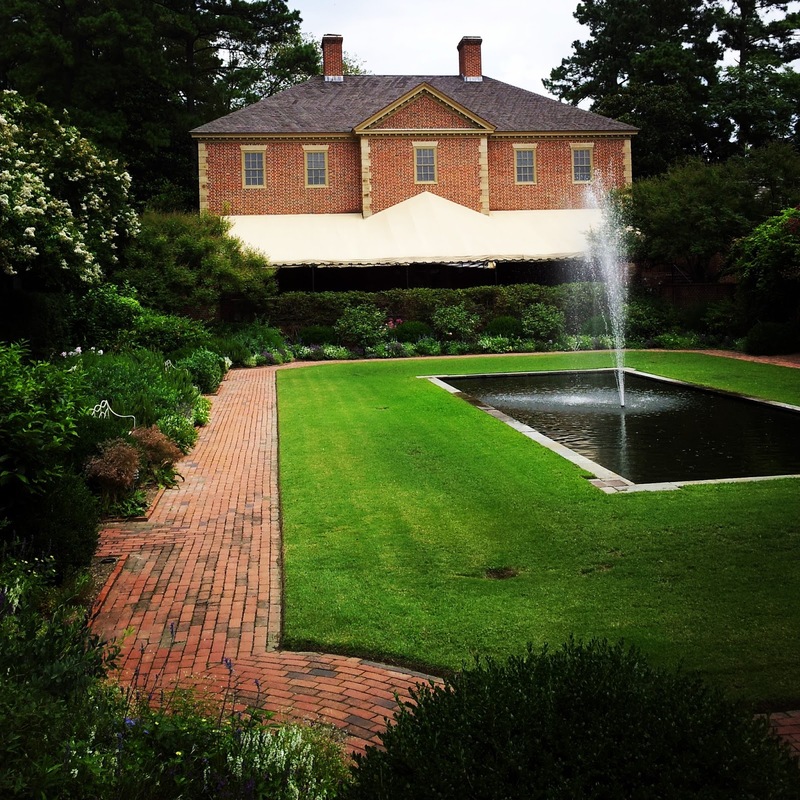 The Spa of Colonial Williamsburg is located next to the Williamsburg Inn. It is a full-service spa with 12 treatment rooms, a conservatory salon, indoor pool, lap pool, sauna, stream room, and fitness center. Since visiting Colonial Williamburg, I enjoy following the @Colonialwmsburg Instagram account I get to see things that I've already seen, and perhaps even make notes for a future trip. This particular Instagram photo caught my eye yesterday. Race Car driver Kyle Busch will be in the Revolutionary City on September 5. I thought it was really funny. "Meet @rowdybusch and @samanthabusch in the Revolutionary City September 5! And enter our #HistoryMeetsHorsepower sweeps for the chance to win a VIP carriage ride with Kyle and tickets to a @NASCAR race @RIRinsider! Ends August 23, 2013. " Hmmm, wonder where Kyle Busch will stay? Maybe the Williamsburg Inn. For more information on travel to Greater Williamsburg, visit www.visitwilliamsburg.com. 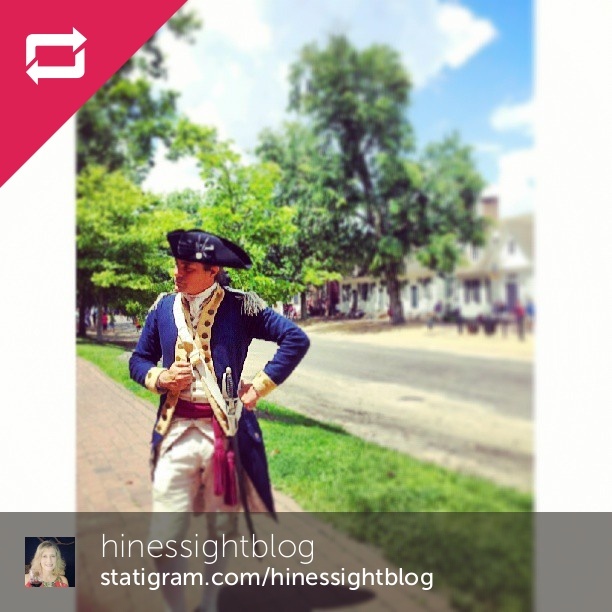 Disclosure: My visit to Colonial Williamsburg was as a media guest on assignment. I received complimentary tickets to the Revolutionary City, and a combination of complimentary and special lodging rates while in the area. As always, my opinions are my own, and we had our own vacation expenses while in the area. I would like to thank Colonial Williamsburg and the DCI Public Relations team for all the media assistance they gave me before, during, and after the trip. 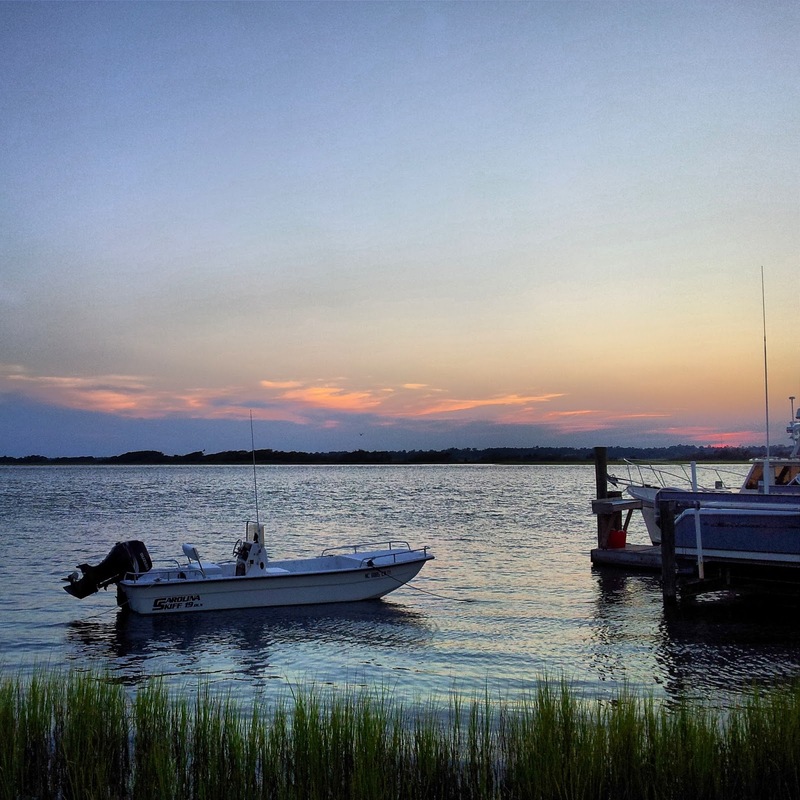 #TravelTuesday: Photos of the Week from Topsail Beach, N.C. I had a glorious week at Topsail Beach, North Carolina. We had six days of laziness. No set agenda. No place to go, and no e-mails to answers. I took tons of photos on Instagram, and if I had to choose a favorite then this is it. I think it sums up the spirit of Topsail Beach PERFECTLY. If traveling to Topsail Beach in the future, here are four things I do each year on every trip. This year, I added a fifth item to my agenda, which I will repeat next year. They are the best I've had, and I've had many. The shrimp can sometimes be too breaded, but dinner here is good, and the view is priceless. I stepped it up this year, and ate breakfast out twice. They have a quiche of the day, and I ordered the special both times. 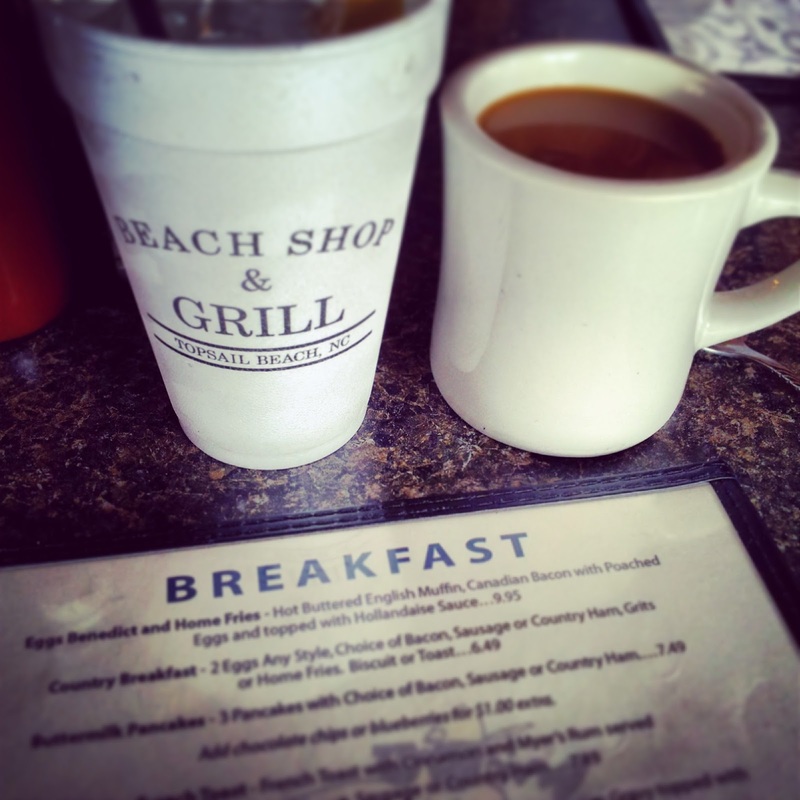 The home fries are good, too. We used to cook a lot at the beach. Now, we're getting more, and more simple. 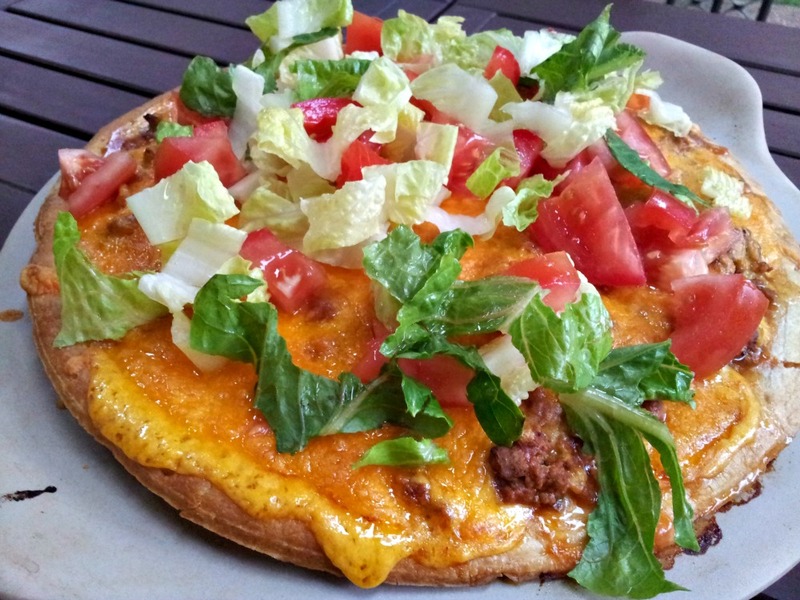 Pizza is always on our list. The New York style pizza that Homeport serves up is good. The perfect combination for us this year was mushrooms, sundried tomatoes and feta. Mamma Mia! That was good! I leave the beach house each year, and grab an iced coffee at this quaint little book shop that now serves food and wine. I didn't buy anything this year, but I made a new friend. His name is Socks. He was quite popular with the cat lovers on Instagram. 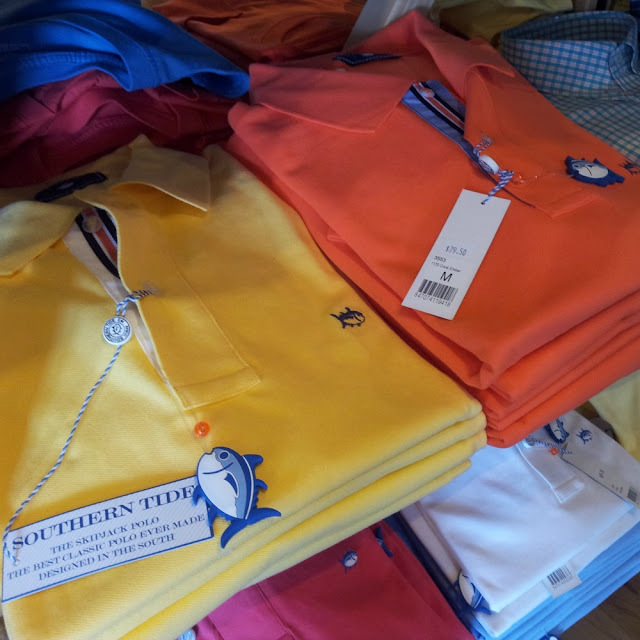 This is a new store is Topsail this year with great lines like Vineyard Vines, Tommy Bahama, and the newly popular Southern Tide. My kids scored new sunglasses this year, and Will bought some shorts. Apparently, I was the frugal one, but I'll be back next year. I am gearing up for Instagram Travel Thursday. Link up with us if you are a blogger. Talk to you later in the week. Also, be sure to check out my feature on the wine I took to the beach this year on Skimbaco Lifestyle. Let's face it. We all get a warm spot in our heart when someone likes a photo that we share on social media. And if someone comments, we really get that warm and fuzzy feeling. First off, I'm a writer. Some may call me a journalist. I like the idea of being a storyteller. I don't claim to be a photographer. Far from it. Photography is not my strength. I was my own videographer when I was in television several decades ago, but I have no real experience in still photography. I just snap photos for my blog, and try to tell you a story. Instagram is forcing me to try to get more creative with my shots and angles. And on occasion, I may snap a photo that everyone loves. That doesn't happen too often, but when it does, I love the interaction and reaction the photo causes. I guess if you make your living as a photographer then one could call it the "money shot." 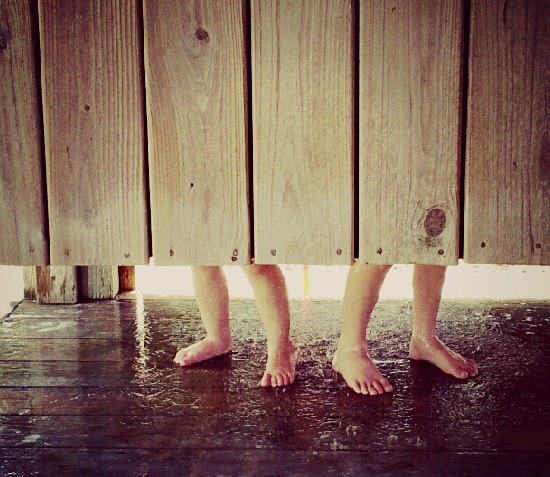 I snapped the "Little Feet" photo last year on Instagram when I had about three followers during a trip to Topsail Beach, North Carolina. I was going up the stairs and saw my children's feet. I thought it was cute. When I shared it on Facebook, and later on my blog, other people liked it, too. Even those people who are on your friends list who never comment at all, came out of the just "stalking" mode and actually had some interaction. I had a "likeable" photo, and some even went so far as to comment. 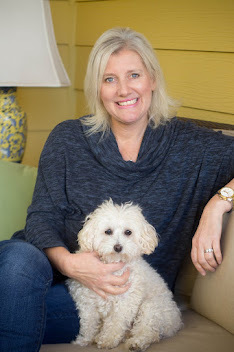 My editor, Katja Presnal, owner of Skimbaco Lifestyle loved the photo so much that she included it in the Skimbaco "Living Life to the Fullest" video this year. I have worked hard to try to get creative with kid shots. It's not easy. I am still learning. The best advice I ever received about Instagram also came from Katja (She's authored this book on Instagram). 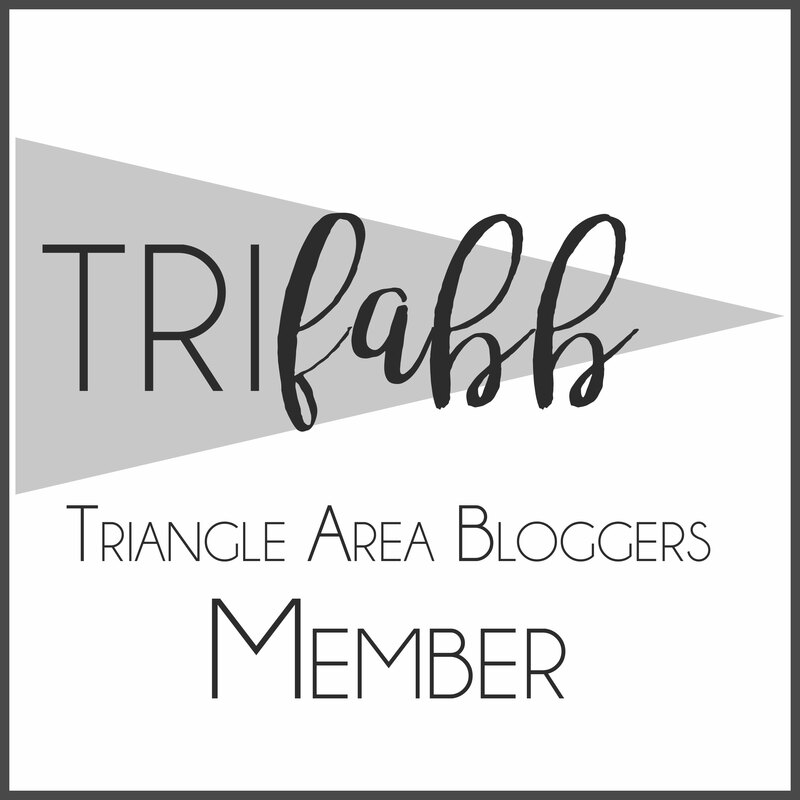 She encouraged me in late Spring to start my own personal account at LeighPHines, and keep my HinesSightBlog account more artistic, and to continue to let it be an extension of my travel and leisure blog posts. Since I write about luxury family travel, I want my Instagram account to allow my followers to experience a destination when I am there. Showing you photos of my kids smiling at the camera is great for the people who have a true connection to me, and know me well in my personal life, but those photos don't tell you much about the destination. 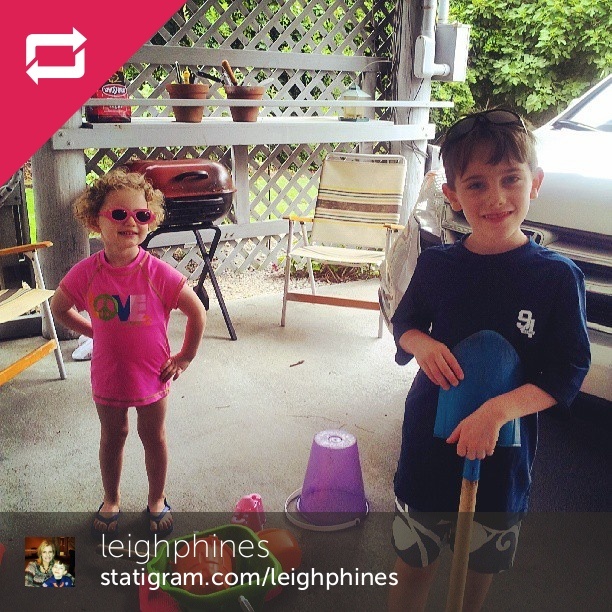 I now keep the majority of my family type shots over at the LeighPHines account, and on my personal Facebook page. That Instagram account looks more like this. 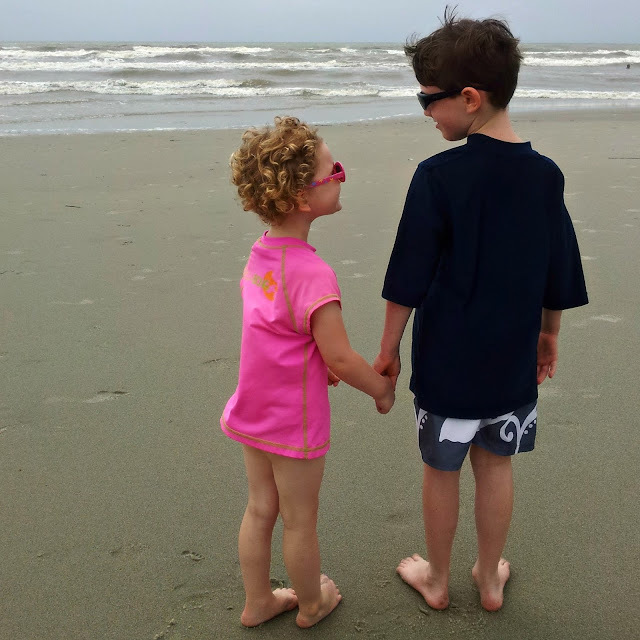 My kids are certainly part of my travels, and are still a big part of this blog so I don't cut my children out of my feed. Instead, I will slip in shots like this one. 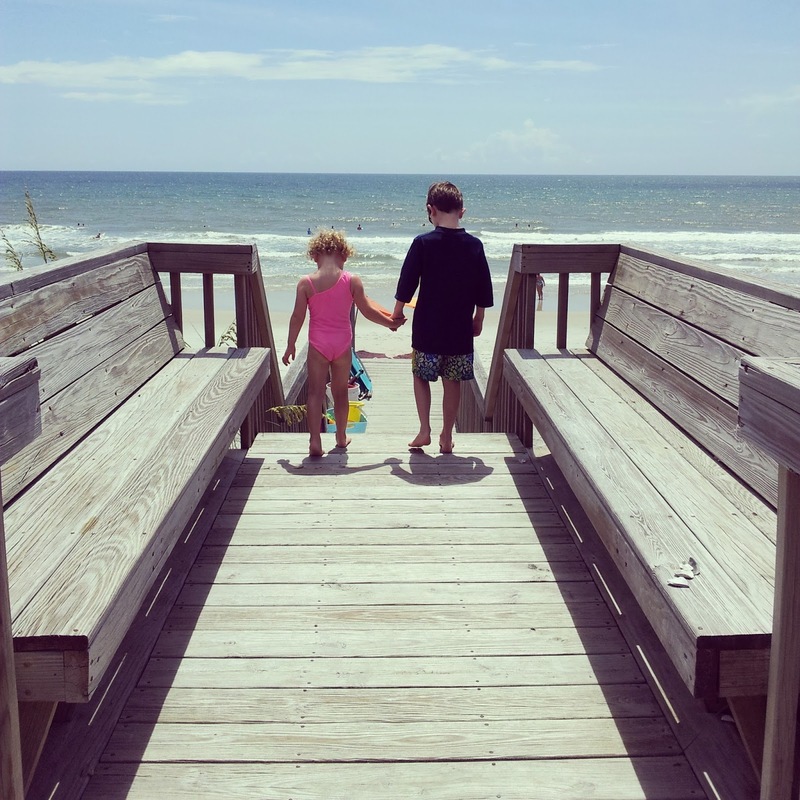 This photo, taken this summer in North Myrtle Beach for Instagram, has probably been my most popular photo with children in it. Again, it brought out comments from people who usually never comment. It even caught the attention of North Myrtle Beach, and they tweeted it to their followers. I do include some family shots in my blog Instagram account on occasion, and I think they are better received because they are more rare than the norm for what I try to do with my blog. This is fireworks night at the beach. My son acted as photographer, which he loves to do. It's a posed photograph, and people gave it a warm welcome in the blog Instagram feed, but it was the first photo they had seen of me in three weeks, and it was 42 shots later from the last time a photo of me appeared in their Instagram feed. Maybe they liked my daughter's sun-kissed cheeks and curly, wild hair. I'm not sure. My husband and I look like we needed a vacation after a vacation. I am at Topsail Beach again this week for our last family beach vacation before school starts this month. I may have used all of my beach creativity on past Instagram shots. We'll see. Follow one or both of my accounts if you want more of the family-life photos, and see if I am up for the photo challenge.